At PG&E, we are proud to work with local governments, nonprofits, private sector partners and other stakeholders to deliver innovative energy efficiency programs to our customers. Doing so is part of our broader effort to offer choices to our customers—giving them better control over how and when they use energy. The benefits add up: over more than three decades, PG&E’s energy efficiency programs have helped avoid the release of more than 280 million metric tons of carbon dioxide (CO2) emissions, based on cumulative lifecycle gross energy savings. San Francisco Mayor Ed Lee and San Jose Mayor Sam Liccardo joined PG&E’s new energy-saving pledge to encourage energy efficiency in their cities, with a chance to earn up to $2 million in funds for local businesses to reinvest in sustainability programs. Sponsored by PG&E, Step Up and Power Down is a community initiative inspiring local companies to adopt behavioral changes in the workplace. PG&E’s efforts are an integral part of California’s energy efficiency model. Over the last 35 years, these measures have helped keep the state’s per capita electricity consumption nearly flat while the rest of the nation’s consumption has risen by 50 percent. PG&E fully supported SB 350 as an important step toward achieving California’s aggressive climate change and clean energy goals. Passed by California’s legislature, SB 350 increases the state’s Renewables Portfolio Standard to 50 percent by 2030, and doubles the state’s energy efficiency goals. The bill supports the Governor’s April Executive Order, which set a new goal to reduce GHG emissions by 40 percent below 1990 levels by 2030. PG&E is working to help customers understand, actively manage and reduce their energy use in homes and businesses across our service area. Among other ways, we give customers detailed usage data so they can track their energy consumption throughout the month to better control energy costs, and we provide incentives to customers who purchase energy efficient products. PG&E reaches customers through a variety of channels, ranging from self-service software tools that provide customized energy insights to one-on-one relationships through seasoned business customer account representatives who work directly with commercial and industrial customers of all sizes. For example, Home Energy Reports show how a customer’s energy use compares with similar homes in the neighborhood, along with savings tips and news about PG&E’s energy efficiency programs and incentives. 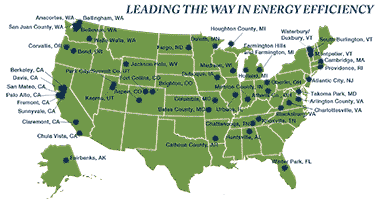 We also serve customers through partnerships with state and local governments and through third-party energy efficiency specialists. Directly encouraging customers to purchase energy efficient products. We give money back to customers who purchase energy efficient home appliances such as clothes washers and water heaters. Our Home Money Saver is one tool to help customers identify the most efficient products to meet their needs. Working with retailers, distributors and others to increase the availability of high-efficiency products. This includes providing incentives to encourage increased stocking, promotion and sales of efficient products such as lighting. We tap into 150 trade professionals who sell, install or service products. We also partner with manufacturers and distributors by offering incentives to distributors who sell qualified high-efficiency HVAC equipment. Advocating for stronger building codes and appliance standards. PG&E is an active member of a statewide team that has provided technical support for more than 125 building codes and 45 appliance standards in California, as well as nearly 90 federal appliance standards or test procedures since 1998. 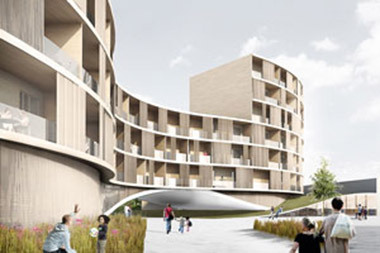 Students at the University of Aalborg in Copenhagen, Denmark, created “The Wave” as part of the competition. PG&E and the American Institute of Architects Foundation partnered with the East Bay Asian Local Development Corporation for the fourth annual Architecture at Zero competition for zero net energy building designs. Through the competition—open to designers, academics, researchers and students—applicants designed a zero net energy building for a mixed-use site in Oakland. Provided innovative financing options. We offer an on-bill financing program to address up-front cost barriers for commercial customers and government agencies. The program provides funding for energy efficiency upgrades with no out-of-pocket costs and zero interest. By the end of 2014, the on-bill financing funded nearly 1,000 loans worth more than $41.2 million. The majority of the loans went to small- and medium-sized businesses. Partnered to serve customers locally. We actively partner with local governments and community-based nonprofits to offer turnkey energy efficiency solutions tailored to local areas. For example, Mendocino County Energy Watch serves as a champion for rural communities and was recently recognized for pushing the envelope on innovative energy efficiency measures. The foundation of this support is PG&E’s network of local, regional and statewide government partnerships that implement energy efficiency and climate planning programs. The programs are tailored to individual communities, in coordination with the Statewide Energy Efficiency Collaborative, and have served hundreds of cities, counties, small businesses and nonprofit organizations, as well as thousands of low-income residential customers. Advanced zero net energy building designs and technologies. We continue to prepare for a future with zero net energy homes through our hands-on classroom and ongoing pilots and research. We also provided technical assistance to architects and builders to help them meet their energy efficiency goals. California energy policy calls for all newly constructed residential and commercial buildings to be zero net energy by 2020 and 2030, respectively. Collaborated with major retailers. We work closely with retail partners such as Home Depot to bring energy efficient products to market. We also worked with ENERGY STAR® staff and other utilities on a pilot program to capture energy savings by motivating retailers to promote, assort, stock and demand more energy efficient models, an important step toward achieving California’s goal to reduce plug loads (energy used by products powered by a plug) by 40 percent by 2020. PG&E and our customers exceeded the CPUC’s energy savings goals for 2014, achieving savings of 1,084 GWh, 197 MW of peak load and 29.6 million therms. These results helped save customers $160 million on their energy bills and resulted in avoided emissions of more than 776,850 metric tons of CO2—equivalent to taking over 163,000 cars off the road. 1 Annual energy savings refer to the first-year impacts associated with installed customer energy efficiency projects. All data is as filed with the CPUC in PG&E’s Energy Efficiency Program Portfolio Reports. 2 In 2013, the methodology for reporting Codes and Standards savings changed from gross savings to net savings, resulting in lower reported savings than past years. 1 Annual avoided emissions refer to the first-year impacts associated with installed customer energy efficiency projects. All data is as filed with the CPUC in PG&E’s Energy Efficiency Program Portfolio Reports. Based on savings achieved through our programs, the CPUC awarded PG&E’s shareholders $36.3 million in incentives in 2014. 1 Shareholder earnings booked in a specific year reflect program performance of the prior one to three years. By investing in energy efficiency, we are making a positive economic impact and creating savings that customers can use in other productive ways. PG&E’s customer energy efficiency programs supported nearly 7,700 jobs and $1.1 billion of economic activity in PG&E’s service area in 2012. This means that every dollar associated with PG&E’s customer energy efficiency programs supported another 80 cents of economic activity. PG&E’s ongoing commitment to implement and elevate energy efficiency programs and policies will continue to support California’s standing as the national leader in energy efficiency. While we have made tremendous progress over the last several decades, there are significant opportunities to do even more. We will continue to look for opportunities to improve our impact, explore new partnerships and engage our customers. For example, PG&E is piloting “Step Up and Power Down,” an energy savings initiative designed to encourage smart energy choices at businesses in San Francisco and San Jose. It is a collaboration between PG&E and cities to inform and encourage people to reduce energy waste by changing their behaviors. Step Up and Power Down also includes a residential component to test how local and community-based approaches can increase customer engagement in the cities of Redwood City, San Carlos and Woodland. PG&E is also piloting an initiative to use energy efficiency to enhance the local reliability of the electric grid. As envisioned, the project would use targeted energy efficiency to reduce peak demand, deferring the need for local investments in substation capacity upgrades. Other efforts include expanding our on-bill financing program by launching a pilot that will allow residential and commercial customers to work with third-party lenders to invest in clean energy projects that can then be repaid on their PG&E bill. PG&E also recently launched the Energy Smart Marketplace, an online tool to help customers identify energy efficient appliances and consumer electronics. PG&E is providing technical support and up to $20,000 in funding for each of the five cities within our service area named as finalists in the Georgetown University Energy Prize, a nationwide energy efficiency competition for small- to medium-sized communities. PG&E’s funding will support residential energy efficiency efforts of each city’s choosing, including community outreach and low-income weatherization programs.